Relax and enjoy the heart-warming aroma and flavor of Lysander's All Natural Cider Spice -- a delicious blend of mulling spices, including favorites like cinnamon and cloves. 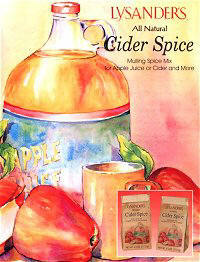 Just add spices to apple cider, juice, or red wine, heat and enjoy a real treat. Have some with a friend or give as a gift. Make great tasting Candy Apples with Concord�s Candy Apple Kit. Each box contains Candy Apple Mix and 12 sticks. Add 2-1/2 cups of sugar and cook as directed on package. Coats up to 12 fresh apples. This traditional red, hard candy coating makes eating apples on a stick a delicious treat for kids. Also great for fairs and other fund raising events. This kit makes 12 delicious soft, chewy Caramel Apples. Each box contains 12 sticks and caramel mix. Just add milk and sugar as directed. For added variety, dip caramel apples in chopped nuts or coconut. Great for fairs and other fundraising events. Each tub contains 14 ounces of sweet, Creamy Caramel. NO artificial flavors, colors or preservatives, NO high fructose corn syrup and is Non-GMO. Each tub contains 1.8 ounces of sweet, Creamy Caramel. A wonderful, old-fashioned fruit dessert � slices of tender, sweet apples under a crispy, flavorful topping of buttery, cinnamon crumbs. Apple Crisp is simple to make, impressive to serve and delicious to taste. Kit requires 6-8 medium to large apples and five tablespoons butter or margarine. For Pies, tarts, spiced cakes, crisps, cobblers and more! If you love to share nature's bounty, you'll find a friend in Mrs. Wages. A full-flavored family of easy mixes to enhance the fresh taste of your favorite foods....and that'll bring a smile to the people you care about!